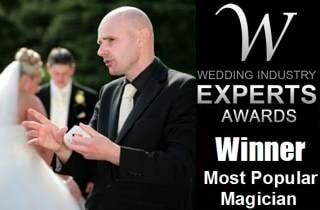 David's phenomenal magical act is ideal for your wedding in Lincoln. Friends and family will be profoundly impressed. 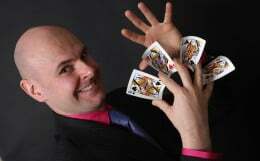 For parties in Lincolnshire, David Fox is the first choice magician. Your event is guaranteed to be a spectacular success. Many Lincoln businesses book David Fox for their corporate events to ensure the highest quality of entertainment. Amaze colleagues, friends and family with magic at your next Lincoln event! For sensational jaw-dropping magic in and around the town of Lincoln, David Fox is the man who can make your next special event one to remember. Whatever the occasion in Lincolnshire, the man who was voted 'The Most Popular Wedding Magician' of 2014, is certain to enchant, entertain and enthrall everyone present. David's magic is suitable for all age groups and the University of Lincoln is an ideal locale for a slick contemporary performer of Mr Fox's caliber. His ability to fit into any social situation and stimulate the proceedings is truly second to none. Well known throughout Lincolnshire and beyond, David amazed large crowds during the Gainsborough Christmas market with deft displays of dexterity, illusion and feats of mind-reading. A wonderful wedding performance at the glorious Harlaxton Manor, (near Grantham) to the south of the county, was very well received (see Kevin and Katrina's testimonial on the site). Indeed, David's ability to perform in any setting was demonstrated when he delivered an engaging parlour show of magic at Beverley's thirtieth birthday party celebrations in the village of Theddlethorpe. Feedback was exceptional, and David's magic ensured the party was a great success! For all types of special celebrations around Lincoln and Lincolnshire, contact us now to find out how we can magically transform your event!